Red herrings, dodgy dealings & murder abound in this gripping whodunit. Enter Inspector Cliff Jordan, a man of insight and perception. But will his investigative skills become distracted? The author, Francis Durbridge (1912-98), is perhaps best known for creating the character 'Paul Temple' who featured in numerous radio & TV serials from the 1930s to 1970s. The Guild Players offering of "Deadly Nightcap" on November 23rd to 25th, proved to be a vintage suited to just about everyone's taste. The play is perhaps not one of Francis Durbridge's best, but nevertheless, master of suspense that he is, it kept the audience guessing right to the final curtain. The number of short scenes into which the action is divided, suggests that the piece was originally devised for television and this must have posed some problems for the company in maintaining continuity without any loss of tension. The Director, Paola Burgess, rose well to the challenge and brought every scene to a crisp end, with the audience baffled or startled and eagerly waiting for more. The single set, designed by Stage Manager Nick Drewry and his team, was the living room and conservatory of the Radford home, which provided a believable setting for murder, attempted murder, accusation and counter accusation. It is almost impossible to summarise the twists and turns of the plot in a few words. But briefly, after her brother had apparently committed suicide, Sarah Radford learns that her husband is planning to murder her to get control of the company, which she and her late brother owned. Part of the plan is to make her think that she is going out of her mind. Rose Freeland, as Sarah, very effectively portrayed the near hysterical anguish that the heroine was going through and also her steely determination not to become a victim. An occasional stridency in her delivery was pardonable when so much of her performance was so convincing. Spencer Clayton played the villainous husband with a fine mixture of overt threats and oily sociability, which left the audience rather pleased than otherwise when he got his come-uppance - and rather sorry for Anna (Davina Page) whom he had embroiled in his plot and who had then turned the fatal knife on him in a very effectively choreographed struggle. She made her mark in the role, as did all the players, even those in supporting parts like Neil Grace, killed off at the end of the first scene, and Sally Martin as the caring Housekeeper. Red herrings of course abounded. What was the significance of the sacking of Geoffrey Curtis (played with convincing nervous intensity by Michael Reece) or his inept attempt at blackmail? Was former victim Kate Warren, in Jo Micallef's self-composed performance, more involved in the deadly schemes than seemed apparent? Did solicitor Arnold Boston know more than he was letting on in Paul Sparks's quietly confident playing? Only the family doctor seemed above suspicion and the one puzzle there was how Sarah could so easily have given way to self-doubt about her health, when she had a doctor, as Alan Kenny portrayed him, with such a powerful sense of caring. The key figure in every Durbridge play is, of course, the detective who unravels the mystery and reveals all at the end. 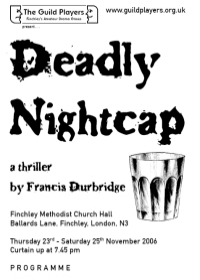 There was something of a variation in "Deadly Nightcap" because this time the detective becomes emotionally involved with the chief suspect and also leaves the Force to become a writer. I was not wholly convinced that Paul Theo, who played the part, was able to keep all these aspects in balance - the shrewd interrogator, the tender lover, the aspiring author. I suspect the writing is not as helpful here as it might be and certainly the play's ending seemed somewhat ambiguous. Nevertheless Paul's was a confident performance which kept the play moving purposefully forward. Backstage everything must have been working smoothly for no blips occurred to spoil the audience's enjoyment. The lighting, especially in the flashback scene, provided effective atmosphere; the costumes created the period and the props were always to hand when needed - sign of a well drilled team. Indeed all aspects of a good night at the theatre were in place: the welcome at the door, the interval refreshments, the comfort of the auditorium, the sense that everything was under control and, above all, a thrilling and enjoyable stage performance by a talented cast well rehearsed.